When L.A. Lakers guard Kobe Bryant was accused of sexually assaulting a 19-year-old woman back in 2003, advertising and marketing professionals across the country immediately began speculating about his endorsement deals. What would happen to his biggest backers? Who would run from him, and who would stand by his side? After all, in the USA, you are innocent until proven guilty (even though, as with the case with Jared Fogle, anything like this is just a PR nightmare waiting to explode). When the dust settled, the expected happened. Kobe Bryant settled out of court with his accuser, and of course, those settlement terms were never made public. But what we do know is how his major backers responded, both before and after that settlement. It's also worth noting that Bryant went on to become the NBA's Most Valuable Player in 2008, so the assault charges did not impact his career. McDonald's were easily viewed as the biggie and, quite possibly, had the most to lose. The fast-food chain had just launched an ad campaign geared toward moms with new salads that showed favorable results. The salads were a hit and are drawing in the families. Plus, McD's had announced a new tagline of "I'm Lovin' It" and was making great strides in bringing customers back. Customers of all ages. Guilty or innocent, the charges alone had plenty of people forming their judgments. That included women, and that's the audience McD's was trying to reach in its new commercials. In 2004, McDonald's cut all ties to Kobe Bryant and never renewed them. The assault allegations were enough to keep a wholesome, family-oriented chain like McD's well away from that kind of scandal. And although the case was settled, the damage had been done, and the mud had stuck. Bryant was damaged goods, and after 3 years with the fast food giant, it was all over. Nike signed Bryant just days before the allegations were made public. The company got a ton of free publicity just from the media exposure, although it's hardly the kind of free press any company wants. Once the settlement was reached, it was plain sailing for Nike. They had signed Bryant to a $40 million contract, and they were not about to let the slide. Plus, unlike McDonald's, Nike is a company based around athletic achievement and does not require the same wholesome family image. Since 2003, the Bryant/Nike deal has been lucrative, earning many millions of dollars for Bryant, and even more for the shoe brand. Kobe Bryant Nike shoes are still big sellers to this day, retailing at over $100 a pair. Some are collectibles worth many thousands of dollars on the sneaker market. However, Bryant comes in on the bottom of the top 10 list of endorsement deals, earning roughly $8 million per year. The top spot still belongs to Michael Jordan, who brings in over $60 million a year just from Nike. Coca-Cola was not ready to ditch Bryant when the assault charges were first announced, but executives were tight-lipped about their plans. Official word at the time was that they were watching the developments of the case. So, you would think that a settlement, and no guilty verdict, would be good for them and Bryant, right? Well, not so. It seems that Sprite is a drink aimed at the younger kids, and the Coca-Cola execs weren't too happy with the image of Bryant and Sprite being synonymous. They let the Sprite deal expire. "Glaceau operates as an independent unit within Coca-Cola. That was a smart decision made by their management when they acquired us. Keeping the people and culture together that made us so successful is the reason why we've had so many years of triple digit growth. So we came up with the decision to go after Kobe because we're fans of his and we liked the fact that he was already drinking Vitaminwater and that was it." When you're looking at a sports-related product like Spalding, a deal with a star like Bryant is a no-brainer. 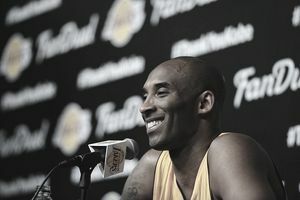 Bryant had been the face of an exclusive line of Kobe Bryant signature basketballs, and his autographed basketballs were going for close to $200 on Ebay.com at the time. Do a quick search right now for Kobe Bryant and Spalding, and you will see that the basketball giant stuck with the star. A Bryant/Spalding basketball sell for between $25-$35 on sites like Amazon and eBay, and now a signed Spalding ball can fetch upwards of $500 or more. The settlement didn't hurt the sales of the basketballs enough to stop the endorsements. The mud didn't stick for some brands, and the draw of Bryant as a big name basketball star was too much to ignore. Both Lenovo and Turkish Airlines inked deals with Bryant after the assault case was settled, and Fortune magazine reported that Bryant made upwards of $20 million in endorsements in 2013 alone. That put Kobe at number 3 in the Fortunate 50 list.